Using magazines | Ici on parle français! I like to use magazines in my senior classes. I base two assignments on magazines articles. The first is an article summary and critique and the other is a presentation based on an article. For the summary, students choose an article from French-Canadian magazines such as L’actualité, La Presse or Le Devoir. They have to also give their own opinion about the topic raised in the article they’ve chosen. I like this activity because it increases their vocabulary and their confidence. Core French students are reading an article that was intended for Francophones, so they’re very proud of themselves for having read and understood it. They also familiarize themselves with current events. Another assignment I have them do is an article presentation. The concept is similar, but it is an oral activity. They need to choose an article, summarize it orally for the class and then ask the class 3 questions based on the article to start a discussion. This is great too because it encourages spontaneous conversations, which is one of my goals. It’s easier to do in the senior classes because they’ve had more exposure to the language. The challenge will be to have simpler spontaneous conversations with the junior classes more often. This activity also helps with a combined class because at least it’s an activity that the grade elevens and twelves can do together. It’s initally difficult to get the grade elevens talking because they’re intimidated by the grade twelves, but I slowly chip away at it, and eventually they get more and more comfortable. I hope these ideas help you with your combined classes. I am a high school French teacher in Ontario, Canada. I've been a teacher for the last 14 years and I love what I do. I am always looking for ways to improve my teaching by learning from my colleagues, reading, attending conferences and workshops. I also completed a Masters of Education degree, specializing in Second Language Acquisition. 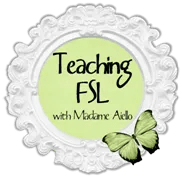 My goal is to increase students' oral fluency in French and I would like to share this journey with you in the hopes that you will find new ideas and be inspired to do the same. I will let you know what I try in my classes and what works and what doesn't. I hope you will find a wealth of ideas to use in your class. This entry was posted in Education, French, High School, Teaching and tagged Combined classes, Core French, Critical thinking skills, Projects, Speaking activities, Writing activities. Bookmark the permalink. I think this would be worth a try in upper elementary as well, with a motivated class, using Les Débrouillards, Cool, maybe something as simple as Pomme d’api…? 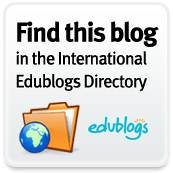 This blog rocks! I gotta say, that I read a lot of blogs on a daily basis and for the most part, people lack subanstce but, I just wanted to make a quick comment to say Iâ€™m glad I found your blog. Thanks.